A simple way to melt wax for batik, crayon painting, candle decorating, ceramic resist, jewelry, sculpture, and lapidary work. 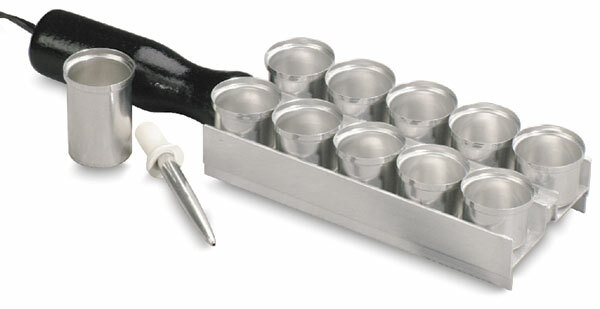 The kit includes a palette, removable cups, and a squeeze pen, all aluminum. The squeeze pen is useful for controlled thin to thick lines. Instructions are included. The Wax Melter operates on household current, and draws roughly the same amount of power as a small soldering iron. Squeeze Pens — These pens are like aluminum medicine droppers, and are intended for working with melted wax. Package of 10.